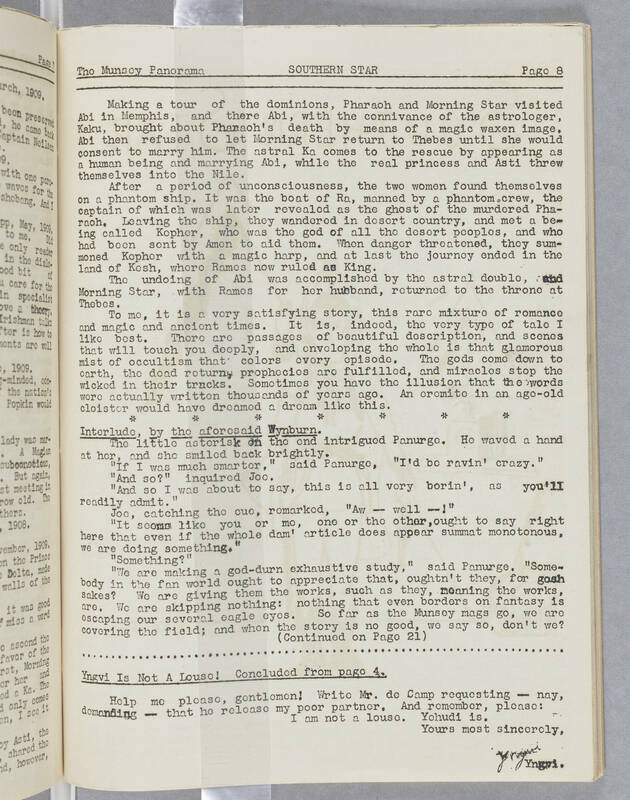 The Munsey Panorama SOUTHERN STAR Page 8 Making a tour of the dominions, Pharaoh and Morning Star visited Abi in Memphis, and there Abi, with the connivance of the astrologer, Kaku, brought about Pharaoh's death by means of a magic waxen image. Abi then refused to let Morning Star return to Thebes until she would consent to marry him. The astral Ka comes to the rescue by appearing as a human being and marrying Abi,w hile the real princess and Asti threw themselves into the Nile. After a period of unconsciousness, the two women found themselves on a phantom ship. It was the boat of Ra, manned by a phantom crew, the captain of which was later revealed as the ghost of the murdered Pharaoh. Leaving the ship, they wandered in desert country, and met a being called Kepher, who was the god of all the desert peoples, and who had been sent by Amen to aid them. When danger threatened, they summoned Kepher with a magic harp, and at last the journey ended in the land of Kesh, where Rames now ruled as King. The undoing of Abi was accomplished by the astral double, and Morning Star, with Ramos for her husband, returned to the throne at Thebes. To me, it is a very satisfying story, this rare mixture of romance and magic and ancient times. It is, indeed, the very type of tale I like best. There are passages of beautiful description, and scenes that will touch you deeply, and enveloping the whole is that glamorous mist of occultism that colors every episode. The gods came down to earth, the dead return, prophecies are fulfilled, and miracles stop the wicked in their tracks. Sometimes you have the illusion that the words were actually written thousands of years ago. An eremite in an age-old cloister would have dreamed a dream like this. Interlude, by the aforesaid Wynburn. The little asterisk on the end intrigued Panurge. He waved a hand at her, and she smiled back brightly. "If I was much smarter," said Panurge, "I'd be ravin' crazy." "And so?" inquired Joe. "And so I was about to say, this is all very borin', as you'll readily admit." Joe, catching the cue, remarked, "Aw -- well --!" "It seems like you or me, one or the other,ought to say right here that even if the whole dam' article does appear summat monotonous, we are doing something." "Something?" "We are making a god-durn exhaustive study," said Panurge. "Somebody in the fan world ought to appreciate that, oughtn't they, for gosh sakes? We are giving them the works, such as they, meaning the works, are. We are skipping nothing: nothing that even borders on fantasy is escaping our several eagle eyes. So as far as the Munsey mags go, we are covering the field; and when the story is no good, we say so, don't we? (Continued on Page 21) Yngvi Is Not A Louse! Concluded from page 4. Help me, please, gentlemen! Write Mr. de Camp requesting -- nay, demanding -- that he release my poor partner. And remember, please: I am not a louse. Yohudi is. Yours most sincerely, Yngvi Yngvi.